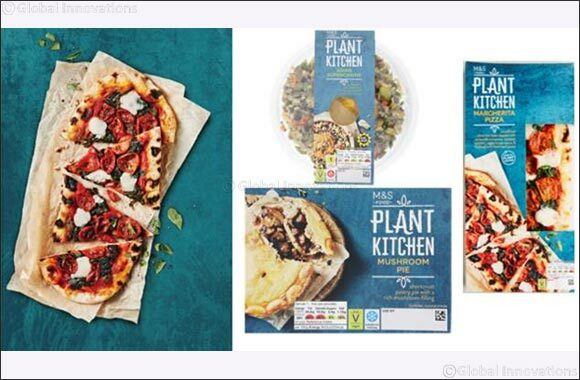 Dubai, UAE, April 02, 2019: Marks & Spencer is proud to announce the launch of its new vegan-friendly Plant Kitchen range. Available in stores now, Plant Kitchen is a brand-new selection of delicious meat and dairy-free plant based fresh meals, salads and snacks, using plant proteins and are 100% tasty! The range includes everything from favourite comfort food such as crispy Cauliflower Popcorn with a spicy Buffalo dip and a flavourful Mushroom Pie, to healthy meals like the Asian Super Grains Bowl and a Roasted Vegetable & Avocado Sandwich, packed with nutritious ingredients and high in plant protein. Marks & spencer is also breaking boundaries with firsts such as the first vegan-friendly Sourdough Pizza, exclusive to Marks & Spencer, using a 'vegan house sauce' and available in two tempting flavours; Margherita and BBQ Pulled Jackfruit. For scratch cooks there’s an inspiring selection of delicious ingredients including No Meat Mince, No Chic’N Chunks and No Beef Burgers, so customers can create their own delicious recipes for the whole family, without compromising on taste. The special range has been developed by an expert team of chefs and product developers including Claire Richardson, Marks & Spencer’s resident vegan who has created all the new prepared meals. The new Marks & Spencer Plant Kitchen range and vegan-friendly products are available in M&S Foodhalls in Dubai, including Dubai Festival City Mall, Marina Walk, Ibn Battuta, The Springs Souk and Mall of the Emirates.